Heart: Broken! 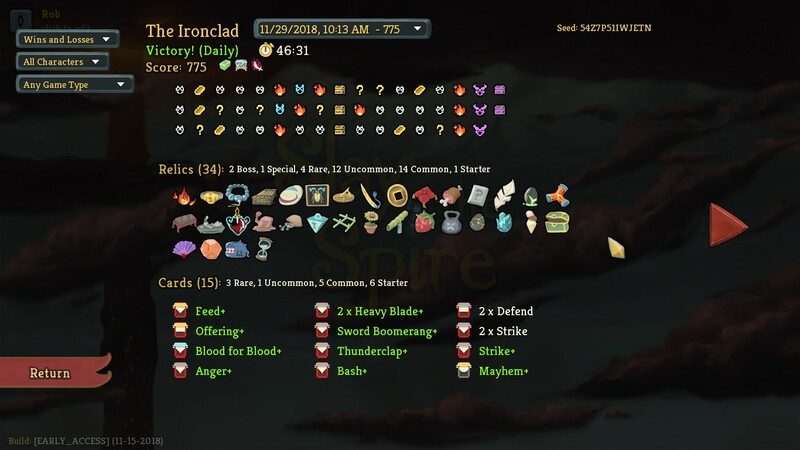 Managed to beat it on my first attempt, with a really nutty The Defect deck. before even playing any cards. Nice going. I made it to the heart last night with the Ironclad, but wasn't able to defeat it. I'm stuck in the doldrums, rarely making it into the third section. Any general advice? I'm trying to build synergistic decks, and I'm tossing some basic cards when I can to try to make pulls more powerful. But it's still knocking me out predictably. - I mentioned this earlier, but try and get rid of as many of the Strike and Defend cards from your starting deck as you can. The merchant, and the "?" spots on the map (especially in the first section), are both good for this. - I almost always avoid actions that would add any kind of curse card to my deck (even if I think I might be able to get rid of it later). - I like to run a good amount of cards that gain block -- probably a third to half of my deck are defensive cards. This helps avoid those unhappy situations/turns where enemies are about to deal, say, 30 damage to you, and you have nothing to block with. - When offered the chance to add a card to your deck, consider skipping taking anything if none of the offered cards are *better* than most of the stuff already in your deck. Otherwise, you are just diluting how often you'll draw your deck's best cards. - After defeating an act boss, I prioritize taking a relic that gets an extra energy each turn (despite there also being a drawback on each of those). The only ones I might not take are the ones that prevent you from seeing enemy intents, and the one that prevents you from healing at rest sites (unless my current deck/character has other way(s) of healing and/or is good at not taking damage). - I usually choose to upgrade instead of rest at rest sites, unless I'm really low on HP, or else there's an elite or boss fight coming up that I feel my current deck will need the extra HP to survive. - I prioritize upgrades that reduce the cost of cards (especially 1 => 0 reductions) or cards that become twice as effective when upgraded (e.g. "gain 1 [something]" => "gain 2 [something]") over the "typical" card upgrades that make the card do an extra 3-4 damage or block. - An exception to the "3-4 extra damage/block are meh" upgrades are "X" cost cards, since the effect of the upgrade is multiplied whenever you play the card in that case. - Second priority for upgrading are those cards that I pretty much always want to play whenever they come into my hand. Might as well make those cards better since they're going to be getting played a lot anyway. - Finally, I'd usually rather upgrade a block card than an attacking card. Taking 3 less damage (i.e. having 3 more HP) is generally better than dealing 3 more damage in a given turn. You can always deal that 3 damage next turn, whereas it's harder to get that 3 HP back. - I usually prioritize blocking incoming damage first, then attacking. An obvious exception if when you can take less damage by killing something that's about to damage you. - Best combo I've had so far with this guy is the power that gets you an extra +1 strength each time one of your own cards deals damage to you, combined with the power that hurts you for 1 each turn and damages all enemies and/or the card that hurts you for 1 each turn and draws you an extra card. A few turns of those working together in boss fights, and you'll be dealing crazy amounts of damage. - The power that makes block persist between turns is also very strong. If you can manage to get the cards, combining that with a variety of good blocking cards plus the card that doubles your block can make you fairly invincible. - Not sure, this is the character I've played the least. Applying some (say, 15) poison, then playing one or two copies of the card that doubles/triples poison, seems to be pretty effective in knocking down boss HP, though. - The power that makes lightning orbs hurt all enemies wrecks fights that involve groups of enemies. Get it if you can. - My first upgrade is usually to the starting deck card that gains a lighting orb, to make it cost 0 instead of 1. - The Defragment power, which increases the effectiveness of your orbs, is very strong. This is one of the cards that you want to prioritize upgrading to make it twice as effective (+2 instead of +1). - The Chaos card that gets you random orbs is also very strong. You can build a pretty effective deck around the idea of just playing lots of orbs, as all of the effects that occur when an orb gets pushed out of the first slot are really helpful. This is another card that you want to upgrade to double its effectiveness (2 orbs instead of 1). Whew! That's probably enough for now? I do about 75% of that stuff already, so I'm on the right track. The other 25% is invaluable and I thank you for laying it out. I find that Silent can benefit not just from collecting poison stuff, but building up Strength or Dex as well. That gives you the long-term, behind-the-shield damage of poison combined with up-front attacking or defending, depending on how the cards fall in that run. Heavy hits plus growing poison kill pretty quickly. Defect... Man, I like to build heavy offense with this guy but I keep getting smashed in the late second level. So I guess I need to go more defense. My favorite card so far is the one that upgrades every card in your deck for the entire combat. Second fave is the 3 point card that gives 2 strength per turn - Demon Form? I play that on IronClad and it's a smasher. And the third, I guess, is the Defect Multiplexer. Can't have enough slots! Got my high score on the very next run. Thanks! And finally ascended on today's second run! Woohoo! But I thought there was a fourth level? You first have to beat the game as each character class in a normal game (no daily runs). After that you have to collect 3 keys during your run to unlock Act 4. Ahh so that's what that was. I was wondering what happened when i didn't get another floor. I've been playing at no ascension level because I wanted that 4th floor. To be clear you can play with or without ascensions to unlock or play Act 4. Just no daily runs. What are ascensions? I see the button, but what does it do? Ascensions are kind of like 'new game +'. I think to unlock it you just have to beat the game with a character, then that character can play Ascension 1. Beat that, and the character can play Ascension 2, and so on. Each Ascension level adds a modifier that increases the difficultly of the game. For example, Ascension 1 increases the number of elites on the map. Higher levels can add a curse that can't be removed to your deck, start you with a lower Max HP, increase prices at shops, etc. The final Ascension level, 20, makes you fight 2 act three bosses in a row to win the game. I dropped down to Ascension 1 to do my runs to unlock the final act. I figured, more elites for more opportunities to get relics. I've also been trying to beat act 4 on Ascension 1 as well, but I haven't managed yet. Now I just have the defect to beat the 3rd boss with. I came close. If I had survived one more turn I would have done it. I haven't played that class so much and still have one more unlock left. I think I'm ascension 12 with the Ironclad and 3 or 4 with the Silent. Well, now I unlocked the 4th floor - tempted to keep playing without ascension level so I can at least see floor 4 sooner. Shiny: Starting deck is replaced with 1 of every rare card. Diverse: Cards are not restricted by your character. Basically your starting deck is filled with every rare card from all 3 classes. There are a lot of fun combos to be mined in that deck. It's the most fun I've had with a daily in a while. I was surprised at how little I enjoyed that deck... It felt more like waiting to get some blocks and regular cards. Way overbalanced on the attack, and with the Defect, there were very few cards to add orbs or rotate them. Kind of disappointing for me. For defense, I prioritized getting Wraith Form upgraded then I used Seek to find it. I was able to pick up a couple more Seeks along the way. The deck was so powerful that nothing lasted more than a few rounds anyway. Also I did practically nothing with orbs. Also, I barely added any non-rare cards to my deck. I did get one Boot Sequence which helped with defense until I could get Wraith Form up. All the elites were dropping rares, so I would prioritize killing them. Finally, I found 2 more Bullet Times which were amazing for this deck. It made all those great high-cost cards drop to 0 Energy. Huh. Didn't think of that wraith/seek combo. Nice one. I did go with the Bullet Times, they were very useful. One came upgraded. I don't do the daily challenge often because I'm trying to work my way up the ascension levels, but would it be fun if the first person to do a daily challenge posted their score and then others could post theirs? The first person could update their post with the other scores if they feel like it so we have them all in one place. The daily challenge leader board can't be filtered by friends. I got 1248 on yesterday's run. I haven't had time to do today's yet. Yeah it is definitely one of my top scores. I tried to kill as many elites as possible which helped a lot. You still get a score I think, don't you? I finished it up after I posted that. 332. I just could not pull a strategy together that came around in time for each combat. We also need Sean Sands to post his scores in here. My score wasn't great but my character was a freakin’ wrecking ball. Beat donut and his buddy in 3 rounds, maybe 4. I also won the 11-29 challenge. My score was 811. I went pretty heavy on strength, heavy blades, and fiendfire to win this one. I beat the heart with the silent tonight! My deck basically had an insane amount of block, with a little poison and some shives. After Image is a great card to have, as it exactly counters the ‘beat of the heart’ effect. One block per card played vs. one damage per card played.